As a new Tesla Model 3 owner, I have struggled with the bluetooth phone connection that is supposed to serve as the primary key for the car. I shared about this in a post detailing some of my learnings from the first 24 hours with the car and was met with a flurry of comments about the phone key. This article will dive deeper into my phone key situation and add further context from around the interwebs from other Tesla Model 3 owners. Before I dive into what is sure to be a critical piece about the car, I’ll start with an overview about the Model 3, lest we lose sight of how amazing the car truly is. This is the best car I have ever owned or driven and I have driven as many cars as I have been able to get my hands on, including darned near every plug-in hybrid, fully electric, and conventional hybrid vehicle available in the United States — and even a few that aren’t. The acceleration and handling in the car are unparalleled at any price and completely game-changing at the expected $35,000 base price of the vehicle. Having said that, the car seems to have an issue with the phone key. To anyone who has used a mobile phone to connect to any other device, that should not come as a surprise. Phones are fickle devices. They work perfectly with some devices and refuse to play nicely with others. Bluetooth and WiFi hardware varies from device to device, as does the firmware, drivers, and user interfaces that make them work. It’s a crazy hodgepodge that works well enough most of the time, but not always. Using my Samsung Galaxy S8 as my primary key for the car has come with mixed results. I have been through a myriad of Android phones over the years and use a Samsung phone because they are consistently more reliable and more stable than any other Android phone I’ve used. It’s like the Apple of Android phones to me … but let’s not start a flame war about which phone is best. Tesla does not recommend or require a specific brand of phone for it to work as the key (maybe it should), so the expectation is that it should work with any modern smartphone. In reality, it works perfectly about half of the time for me. I walk up, see the car wake up (mirrors start to open), and I’m able to open the car. Maybe 1 in 4 times, the car will unlock after a few seconds of waiting next to the car while I work through the process of unlocking the passcode-protected phone to open the app and manually unlock it. The remaining 1 in 4 times, I have to manually unlock the car from the app. This is definitely a “first-world problem,” but the fact that a 2018 Tesla is more complicated to unlock than my 2010 Toyota Prius, which required zero touches of the key, ever, is a bit silly to me. Personally, I love that Tesla is pushing the envelope across the board, but I do wish it would have rolled out the car with a key fob, with the phone key as an alternate option as they tested it and confirmed that it worked. I know that’s more expensive to do and the Model 3 is all about cost savings, but that doesn’t mean it’s okay to deliver an inferior, regressive product. Tesla notes that the phone key will allow drivers to “unlock your Model 3 without ever taking your phone out of your pocket,” which as I’ve just explained is quite optimistic. “We recommend the Phone Key as the primary method of accessing and starting your vehicle.” I suppose this is possible if you can unlock your phone and switch to the Tesla app and tap the unlock button without looking, but that has not been the reality for me. But enough about me — let’s take to the internet to see if other Model 3 owners are having better luck. 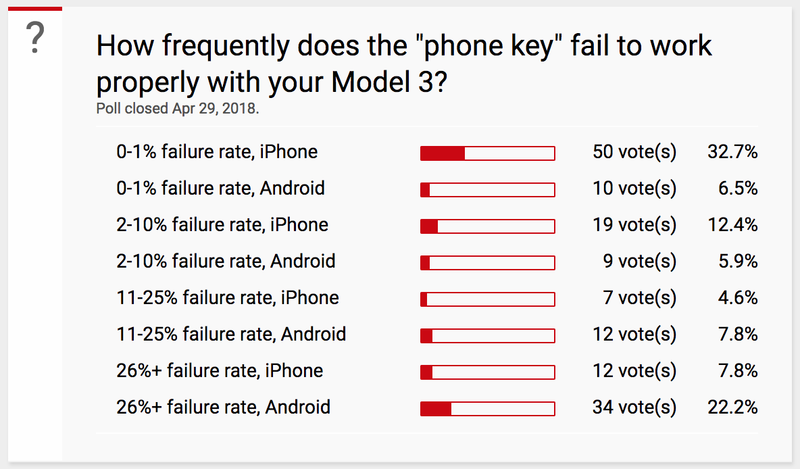 A recent poll on the Tesla Motors Club forums asked Model 3 owners about their failure rates for the Model 3 Phone Key. The results are all over the place. A large chunk of users (39%) expressed a failure rate of less than 1%. At the other end of the spectrum, a full 30% of users had problems more than 1 in 4 times. I’d put myself in that category … or very close to it, as I would only call the times I had to actually unlock the car from the app “failures.” The remaining users are somewhere in between, meaning a full 60% of users had issues more than 1% of the time. It’s not the end of the world, but it definitely begs for some attention from the manufacturer. Users across Tesla forums far and wide have lamented the fact that the Phone Key for the Model 3 does not work as expected, dedicating numerous lengthy threads to the topic. The feedback is the same in that the solution does not work reliably, with some users even going so far as to fashion wearable Tesla key fobs that allow them to unlock the car with a reconstituted Tesla bracelet key. 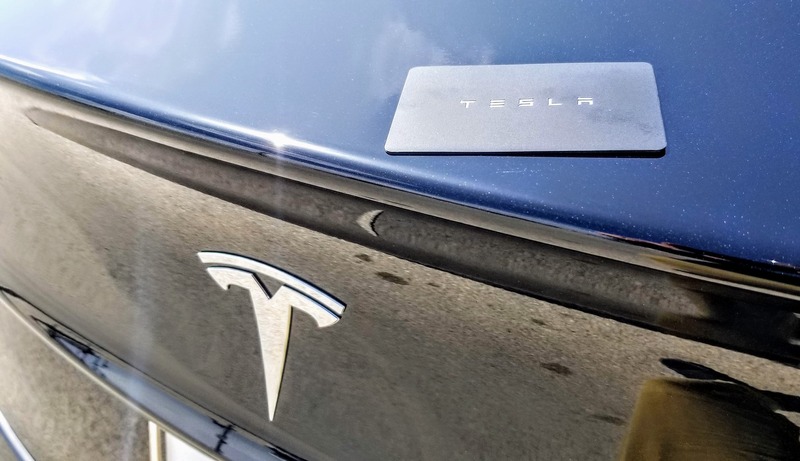 To its credit, Tesla has acknowledged the issue, with CEO Elon Musk admitting that the Phone Key is not working too well and that “we really should do something better.” Consumer Reports related that Elon said “we really need to provide a normal key to the customers of this car.” Time will tell whether or not this happens, but we have reached out to Tesla to get a formal statement and timeline for a fix. We will update this article if/when we hear back.